Concrete anchor bolts are used in new construction to secure a structure's walls to concrete slabs and foundation walls, to fasten steel columns to concrete piers and to anchor machinery to concrete pads. 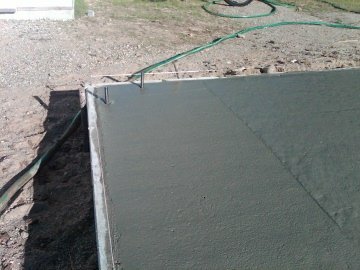 These anchor bolts are sunk into the wet concrete by hand immediately after the concrete slab is poured. You can leave as much of the bolt sticking out of the slab as you need. The anchor bolt can be straightened or plumbed as the concrete hardens. There are basically two types of anchor bolts for concrete; J-bolts and wedge anchors. Click on the picture above if you need to purchase these types of anchor bolts. J-bolts are set into fresh concrete. This type of anchor bolt is shaped like the letter L, so it can not be pulled out of the concrete after the concrete has hardened. J-bolt anchoring bolts come in many different lengths, the most common are 6, 8, and 12 inches long. These bolts are threaded at the top, for about two inches, and the rest of the bolt is smooth. We use this type of concrete anchor bolt on almost all the new concrete slabs we pour. As soon as the slab is poured we go back and sink the anchor bolt down into the concrete, leaving the threaded portion sticking up high enough to secure the walls with a washer and nut. The J-bolts we use are a half inch in diameter. They come in many diameter widths to accommodate heavier loads. 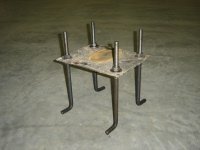 You also have the option to choose an anchor bolt made from regular steel, galvanized or stainless steel. For the larger and heavier cast in place anchor bolts it may be necessary to use a template or a plastic sleeve to hold the bolts in place until the concrete sets up enough to support the weight of the bolt. Using a template will help keep the bolts straight, plumb and the correct distance from each other. 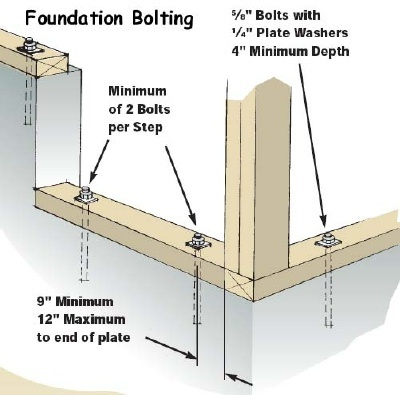 If you are using anchor bolts for concrete slabs or foundations it's important to place the bolt in the concrete so it's in the center of the wall. For 2 x 6 walls the bolt would be 2 3/4 inches from the outer edge and for 2 x 4 walls the anchor bolt would be 1 3/4 inches from the edge. Use the building plans to mark out the anchor bolt locations before the concrete is poured so a bolt isn't placed in a doorway or directly under a stud. Click on CONCRETE WEDGE ANCHORS to learn how to secure or fasten things to concrete that has already hardened. Click on CONCRETE FASTENERS to learn about another way to fasten things to concrete.